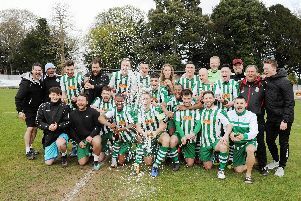 After months if not years of fighting the inevitable, the Chichester & West Sussex Sunday Football League has finally had to call time after 51 years of service to the local footballing community, writes Colin Davis. A steady decline in the number of member clubs since its heyday in the mid-90s of some 60 teams in six divisions to just the six teams for the 2017-18 season meant the writing had been on the wall for some time. The CWSSFL is not alone with such problems – there are now only two adult, male 11-a-side Sunday Leagues remaining in the whole of Sussex. So what has caused such a dramatic fall in support for this well-established league? A number of factors are believed to have made an impact. There have been atleast three seasons over the past decade where the programme was all but obliterated through bad weather. Within the ability of the governing powers above the grassroots football network would be more investment in facilities at the lower levels to improve facilities for all. So much TV money seems to pour into football at the highest level with what feels like such a small percentage finding its way to the very foundations of our national game. It can also be considered that during these ‘wipe-out seasons’ a number of players (and their partners) got used to not turning out on a Sunday morning – and we failed to attract them back. Ultimately no league is a league without players who, from this generation, have gone soft and can’t get out of bed after a few drinks. The rise of midweek, small-sided football allowing players to get their fix on all-weather surfaces with little or no regular obligation or commitment is another issue. Perhaps the offers of free kits and other inducements was just too hard to ignore. Then there’s an apparent change in sporting culture in schools where it seems to have become important for the award of participation trophies for all. Competitive leagues don’t operate like that – you deserve what you win and have to work damned hard for those achievements. We’ve lost count of the number of teams withdrawing over the past seasons once it has become apparent they’re not lifting a trophy that season. Many would also disappear just as they could be considered to be achieving greatness as they gained promotion to our top division, probably frightened off by the prospect of sterner tests on a regular basis. This is despite us listening to various concerns over what was considered draconian regulations regarding a player’s intermediate or senior status and removing such restrictions to ensure a level playing field for all. They moaned, we listened and reacted, all to no avail. Over the past 20 years it has to be acknowledged that society and our everyday culture has changed beyond all recognition. That is not the fault of grassroots football. Twenty-seven years ago, when I first became involved in Sunday football, the seventh day was a very different affair than today. Sunday trading barely existed, live football did not have what seems to be almost blanket all-day coverage then. Sunday was not the working day it now seems to have become, but a time for recreation – and a game of football was part of that day for many. The decline in the number of pubs, compounded with the fact that those remaining are not so inclined to support a Sunday league team administratively, financially or logistically as they once were, has had a dramatic effect. Those wonderful days of the Dog & Duck playing rivals The Queens Head and others ended some time ago and with it went a large core of Sunday football. Workplaces were also a great source of our clubs in years gone by. Smaller workforces, liabilities and no doubt other controversial factors killed that line of supply too. Another, more recent distraction seems to be the increasing popularity of virtual reality football. We see so many references on social media these days of what FIFA18 and Football Manager achievements have been met by those whom should really be out there involved in the real thing! It is surely a fact that these are the very people that should be playing, managing and running our clubs instead of being content with virtual accolades. These are just four reasons we believe have left us to this sorry state of affairs, there are no doubt many more. With the writing on the wall for some time attempts were made to halt the decline. The advent of the internet was fully embraced, league rules were simplified. Online registrations, and match and result reporting just two examples. For our golden jubilee celebrations in 2016-17 we did not charge affiliation and cup entry fees, to reward and support our member clubs. Processes for the administration of clubs was made simpler and as a League we strove to reduce the significant amount taken in Fines from our clubs. We achieved this so well thatf ines (other than for unfulfilled fixtures) all but disappeared. This last season in particular we adopted a most flexible approach to rearrangement of fixtures to accommodate other important events, like wedding and Christenings. Another innovation was to restrict the number of players that may be registered with a squad to just 30. The rationale here was to prevent the rise we had witnessed of certain clubs registering more than 50 players each season. Surely, in an 11-a-side sport (plus subs of course) no club being managed in a responsible way would ever need so many players. The expectant hope here was that those who found themselves unable to find a place in any squad would tackle that issue by forming their own clubs and teams. Unfortunately, that plan also bore no fruit. Many drives to encourage existing clubs at various local levels set up their own Sunday team and the setting up of new clubs has also been explored, again with limited minimal success – leading us to the current state of affairs. The death knell for the league was ultimately sounded at a special general meeting with a resolution for the dissolution of the league being passed unanimously. Another indicator was that although all last season’s member clubs were eligible to attend, vote and had been invited to the meeting, only one club bothered to send a representative. Since the decision, the existing officers have begun the task of winding up the business of the league together with dealing with its assets and liabilities. Various communications are being sent out to interested parties as quickly as possible. To this end it would be most helpful if any person, family, workplace or club feels they have a claim on any of the trophies currently held by the league that they contact me by email at secretarycwssfl@gmail.com – giving full details of the trophy concerned and what claim they feel they have upon it, no later than August 31 this year. Unclaimed trophies will be forwarded to the SCFA in line with FA rules. Finally, thank-you to everyone in the local community who has supported this great league over the past 51 years in whatever capacity. In particular, a special mention to Arundel Football Club whose facilities have been available as the league headquarters for as long as many of us care to remember. The support, and recent messages received since our demise means an awful lot to us all. CWSSFL, gone but hopefully not forgotten! League secretary Colin Davis said being involved with the Chichester & West Sussex Sunday League had been great fun. “Serving as the league secretary for the past four seasons has been a great honour,” he said. “My colleagues on the management committee and I have striven to improve matters but when you are faced with just three clubs signing up for the 2018-19 season there was only one decision we could sensibly make. “As a management committee we all agreed to carry on through last season even though we had just six teams. We fulfilled that promise and our forlorn hope was that we would see players previously involved with us miss their Sunday morning football fix enough to return. Many people have spoken on social media of their sadness at the league’s demise.